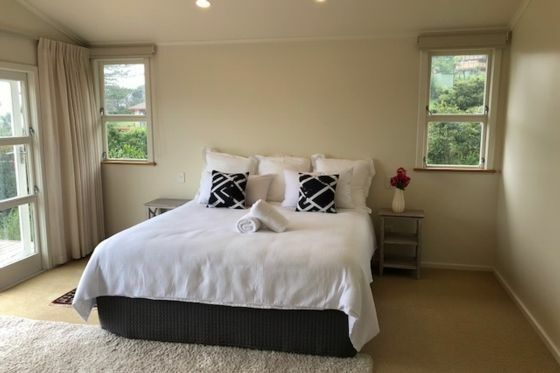 Elevated above the lapping waters of Mill Bay in Mangonui is this 3 bedroom holiday home just waiting for you to create special holiday memories in. The peace and tranquillity of the bay is captured in the furnishings and ambiance of Ranginui . This magnificent holiday home is full of light and colour and creates the perfect spot to base yourself in, whilst exploring the fantastic Doubtless Bay area. Ranginui is in a quiet cul-de-sac in the heart of Mill Bay and within an easy 5-10 minute walk of the Mangonui township where you can pick up that morning coffee and newspaper. The indoor outdoor flow is fantastic with every room in the house opening via French Doors onto the huge split level deck with those magical views of the Mangonui Harbour. Ranginui has plenty of spaces to capture the sun, all of which are very private and peaceful. Three good sized double bedrooms and two full bathrooms. One bedroom has the ability to be two king single beds or one super king for added flexibility The Master bedroom has en-suite facilities and the house bathroom is situated between the two other bedrooms. The owners have planted extensively to attract native birds and to provide privacy. Plenty of outdoor furniture is provided to make the most of the decks and views. Built for the sun and views Ranginui is a great spot to return to, at the end of your day exploring, to have that evening BBQ enjoying the sunset over Doubtless Bay. Prices are for 2 people.Extra guests are charged at $20 per person per night. Superking can be split into two king single beds if required. Well appointed, great kitchen, decks with views, best house designs we have seen. We will come back again, great place for a family reunion. Besides the house, Mangonui village is delightful and an easy walk. Property was in a great location to base ourselves to explore the far north. The rear deck was awesome, great to enjoy a cold beer and take in the fabulous views of mill bay. A spacious property with comfortable and inviting beds. We were sad to leave. Spacious, excellent view and great deck. Perfect spot to recharge you're batteries. The home is spacious and well equipped. The view is excellent, we really enjoyed relaxing on the deck. The home gets plenty of sunlight which is marvellous! Very convenient spot to local cafes, restaurants and beaches. Thank you Richard for looking after us. Will be back for sure! The house is stunning!! Gorgeous views, so much space, very clean and lovely inside. The house is stunning!! Gorgeous views, so much space, very clean and lovely inside. The deck was amazing! Couldn’t spend enough time out there checking out the views. Super easy walk to town and easy access to the highway. House was well stocked and new. Great place! Couldn’t recommend it more and if we find ourselves out that way we will definitely book again. Plus being able to bring the dog! She loved it too! !